When my former work colleague, Bob Baker, bought Patcham Windmill it had been derelict for two years and was in a bad way. Eleven years later and after having just undertaken a five month redecoration, Bob is now looking to sell which prompted me to ask for a tour for myself. I first visited at night and after finding my way up the dark private road was immediately impressed by the privacy that this isolated, high-walled and secure property offers. 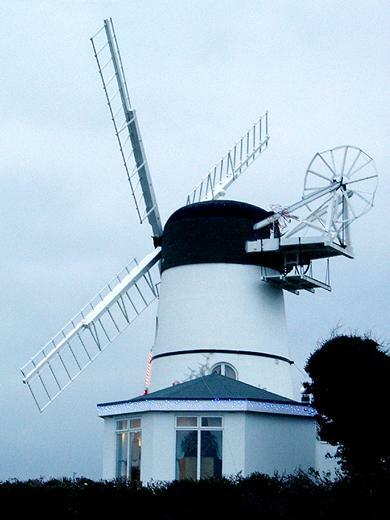 The structure consists of the converted windmill, which was built for Joseph Harris, a baker, in 1884-5, along with an octagonal 1960s two storey extension and a large wooden conservatory. 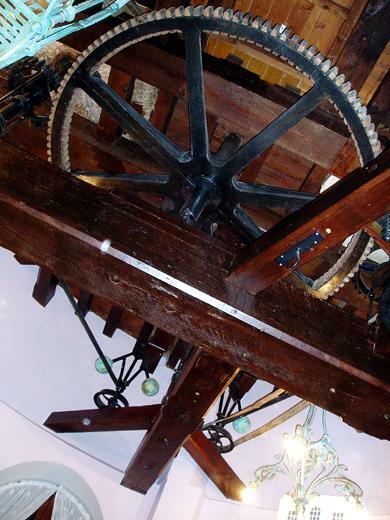 It was originally called Waterhall Mill and part of its machinery came from the old Preston Mill. It was the last brick tower-mill erected in Sussex and continued to grind corn until 1924. Its sails, which were renewed in 1990, are an impressive 55ft. In 1928 it was sold for just £50 and in 1936 was converted into a house. Most of the working machinery is still in place including the last three working millstones. As decorative features, several of the old millstones have been built into the staircase and boundary walls. Starting up the mill is quite a task but, in theory, possible – the massive 2ton 10ft brake must first be released though. It goes without saying that the views over the South Downs from the rendered five storey 50ft tower are spectacular. For this very reason it was requisitioned by the Home Guard during the Second World War. It is believed that the spiral staircase in the tower originates from St. Paul’s Cathedral which makes sense as one of the previous owners was an important clergyman. It reverted to private use in 1950 and was Grade II Listed in 1952. In more recent times, a lightning strike caused considerable damage leading to a massive repair programme. Until 1993, all knowledge of an underground top secret Second World War intelligence centre was denied by the MOD, but one local resident, Geoff Ellis, knew the truth – he watched the excavations as a small boy. In 1941, 130 miners dug 550 yards of tunnels through rock chalk and seams of hard flint 20m below South Heighton, north of Newhaven, in just 17 weeks. The purpose of the project was to house 100 or so naval personnel who monitored the sea off the Sussex coast midway between the strategic ports of Dover and Portsmouth. Staff co-ordinated and controlled shipping movements and plotted enemy ship movements in the English Channel using radar. The tunnels had a small opening at the base of the hill but the main entrance was at the top of the hill in the Guinness Trust Holiday Home that was built in 1938 but requisitioned by the Royal Navy after Dunkirk in 1940. The building and tunnels were named HMS Forward. After the war, the MOD sold the lot to a property developer which led to many houses being constructed over the tunnel. Today, Geoff Ellis helps the Friends of HMS Forward, whose objective is to “restore the tunnels to a standard conforming to current legislation suitable for public access as a site of historical interest”. The tunnels were once used to defeat the Germans but a new enemy has now surfaced – one particularly difficult resident who lives above won’t allow visitors below his land and is trying to persuade Tony Blair to fill in the tunnels. This legal situation can be compared to that of the residents above the disused Kemp Town rail tunnel that runs from the bingo hall on Eastern Road to the school on Elm Grove. Fortunately, in June 2000 English Heritage declared these tunnels to be of National Importance. For more information on Newhaven and the tunnels go to www.newhavenmuseum.co.uk and www.secret-tunnels.co.uk. Newhaven Museum’s curator, Peter Bailey, likes to talk and knows everything about everything! The museum has many great displays including a scale model of the tunnels. Outside is a rusty WWI U-boat gun that was pulled out of the Channel 80 years after sinking and has been on display since 2001. Sussex Police looked rather silly recently when they asked for a firearms certificate for the 16ft chunk of iron that is blocked with shale, mud and a metal stopper. No, this photograph wasn’t taken in rural Sussex. 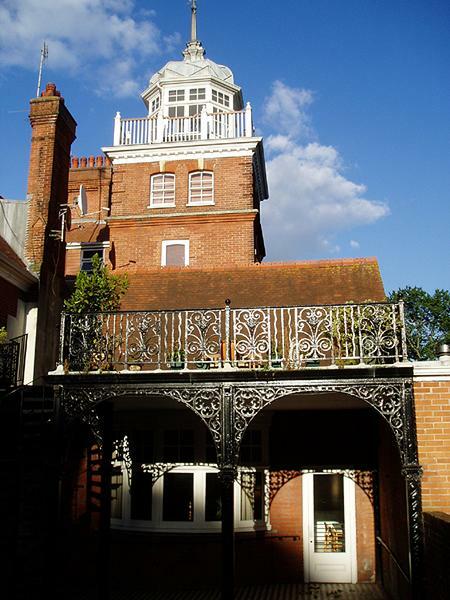 Fantastic features such as a domed tower, symmetrical bays, elegant gables and an intricately detailed iron balcony at the rear, make Tower House Brighton’s finest Edwardian residence. Modifications have certainly been made since Tower House, on the west side of London Road, was constructed in 1902 though, on the whole, the main building survives intact. It was originally one of two buildings that occupied a plot that was once known as the Strawberry Gardens, a pleasure ground opened in the 1830s. The second of the two properties on the site was called Tivoli, originally Shalimar, and was built a year after Tower House. The gardens, with tree-lined walks, shrubberies and flowerbeds were improved during the 1850s and renamed Tivoli Gardens. They were closed in 1888 when the land was sold to R. C. Gazeley, the owner of the neighbouring property, Elms Lea (now the Elms Lea Avenue housing development). Tower House was designed for James John Savage by G. Burstow & Sons. Savage was a jeweller by royal appointment to Edward VII and the family monogram can still be seen above the front door. Unusual features included under-floor heating and a bath fitted with a shower – shocking! Mr Savage died in 1922 aged 75 and Mrs Savage, renowned for her parties and charitable events, died in 1933 aged 81. The twelve-bedroomed property was then sold at auction for £4000 but soon after requisitioned by the army for the duration of the Second World War. The next shock came in 1988 when Tower House was purchased by Cussins Green Homes with development in mind. It was converted into flats but got off lightly compared to Tivoli, which was completely demolished. The Robinia Lodge and Towergate flats, along with an adjacent terrace of houses, were built on the combined grounds. The green ivy that once covered Tower House has been removed and today the bright red bricks and wooden details are on display in their full glory. 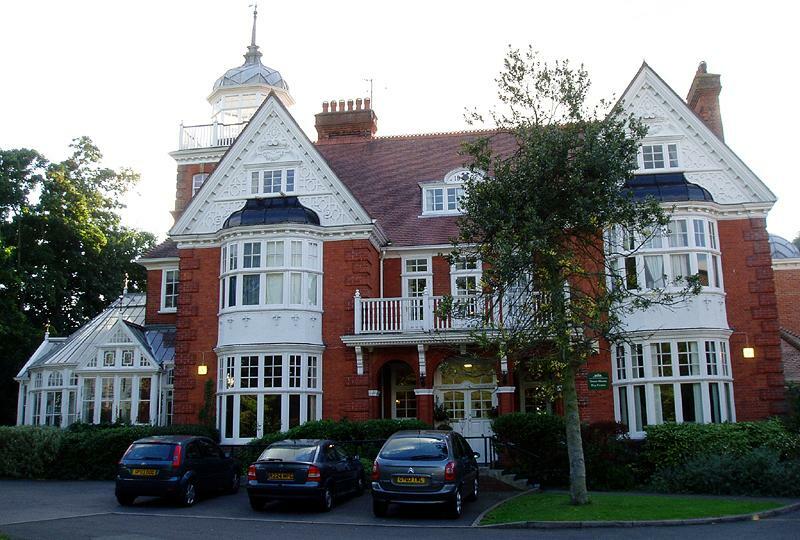 The building, including its fine conservatory, is in tip-top condition generally and now operates as the Tower House Day Centre, run by Brighton & Hove City Council. I’m obviously not happy about the idea of conversion generally, but if such a measure saved this Edwardian masterpiece from a fate that was met by many of the neighbouring villas then I guess that I can live with it.